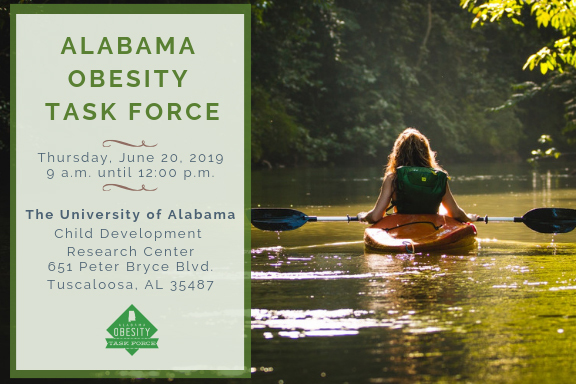 The next Alabama Obesity Task Force Quarterly Meeting is scheduled for Thursday, June 20 at The University of Alabama, Child Development Research Center (651 Peter Bryce Blvd., Tuscaloosa, AL 35487) from 9 a.m. to 12 p.m. Visitors and new members are always welcome! If you plan to attend, please RSVP here. Ruth Brock, MEd with the Alabama Extension System at Auburn University provided an update on the ALProHealth Program. The program received additional funding from the Centers for Disease and Control and Prevention through 2023. They'll be working in 13 high obesity counties in Alabama to improve access to healthy foods and increase the number of places for physical activity. Kim Garza, Associate Professor in the Harrison School of Pharmacy at Auburn University gave a presentation on her research on the implications of an impulsive choice as it relates to heart health and diet. She discussed interventions to improve health behaviors and factors that support better outcomes. Allison Tubbs is a project coordinator with the Lakeshore Foundation. She gave an update on the 100 Alabama Miles Challenge which is an initiative to increase physical activity utilizing local, state, and federally managed recreational lands in the state. Start your journey today! Please visit our archive of minutes from meetings prior to 2011.